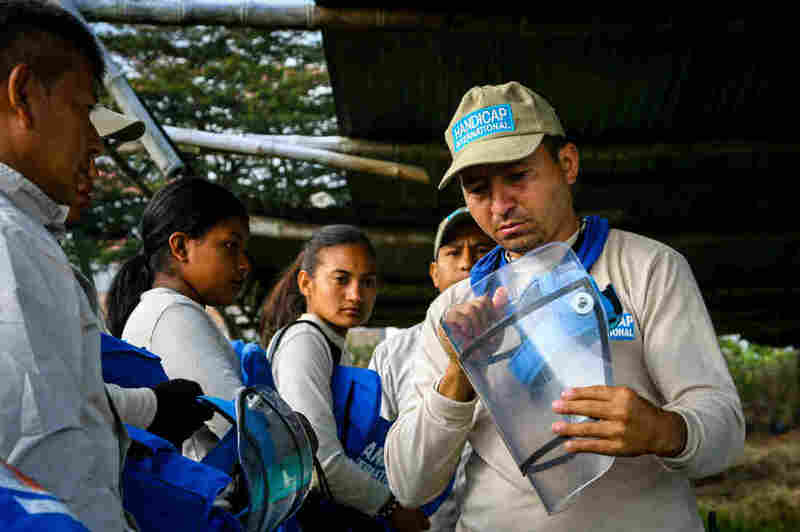 Colombia, One Of The World's Most Heavily Mined Countries, Begins Getting Rid Of Its Land Mines : Goats and Soda Now that the rebels and the government have reached a peace deal, the slow process of de-mining is underway. 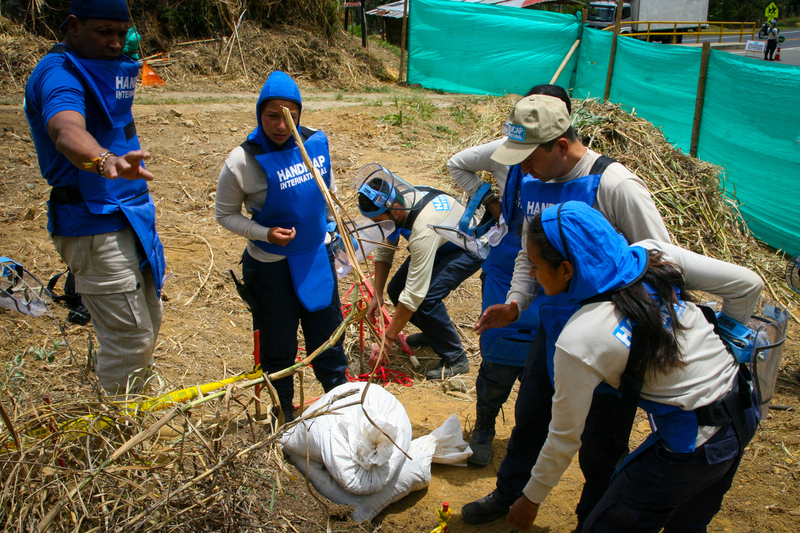 Members of Handicap International's de-mining team in Colombia debate how best to destroy an improvised explosive device that they unearthed. Canas stepped on the mine during a protest for indigenous rights in the southwestern region of Cauca in Colombia. He was with a group of friends, and they wanted to get to the front of the march. So they ran off the main road to cut ahead. "After the accident I was in the hospital for four months," he says. Mines are strewn all over Colombia — a legacy of more than 50 years of fighting between the heavily armed, well-financed FARC rebels (also known as the Revolutionary Armed Forces of Colombia) and the government. Both sides used mines, although the military says it has cleared the explosives it planted defensively around bases. Since the peace accord with FARC was signed last year, efforts are ramping up to clear what could be tens of thousands of mines that still litter the Colombian countryside. 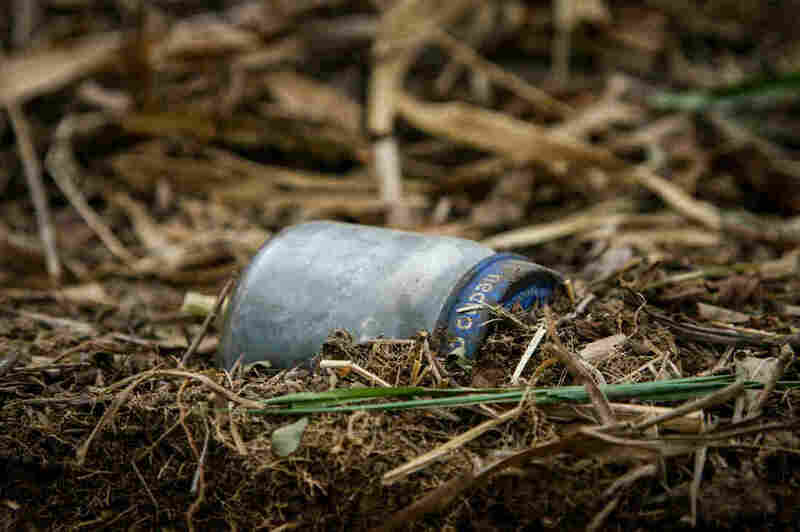 A baby-food jar packed with gunpowder and ball bearings found in a field in La Venta, Colombia. Improvised explosive devices such as this were commonly used during the decades-long conflict between the FARC rebels and the Colombian government. According to government statistics more than 11,000 people in Colombia have been injured by land mines over the past decade. Nearly 2,300 of those blasts were fatal. The International Campaign to Ban Landmines lists Colombia as one of the most mined countries in the world. 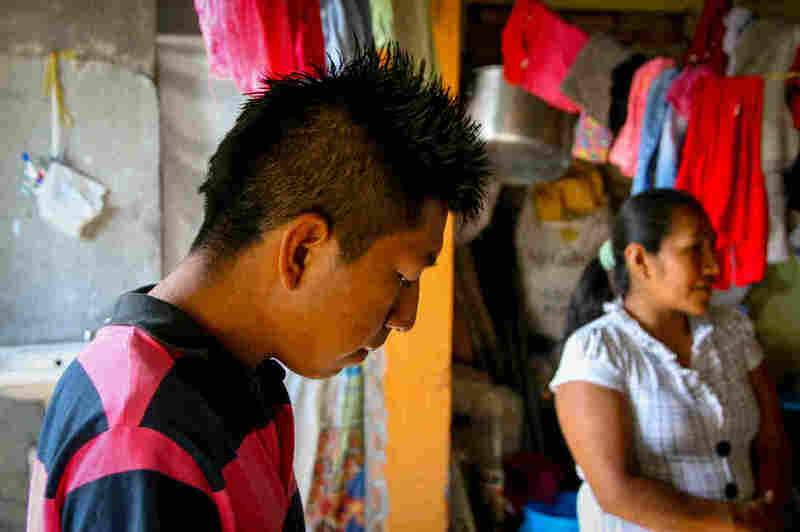 For Canas, the 2012 blast didn't just affect him physically; it killed his dream. "The hardest thing is that I can't go back to playing soccer," he says. Canas is a soccer fanatic. Before his accident, he says, he played constantly. He still avidly supports Atletico Nacional, a professional team in Medellín, but his playing days are over. Handicap International is one of the groups setting up de-mining teams. A team from the nonprofit has been clearing a suspected minefield in the southwest of the country, near where Canas was injured. Virgilio Cifuentes, a supervisor of the de-mining team, says leftover mines and even rumors of leftover mines have a chilling effect. "It creates fear in the whole community," he says. Cifuentes' crew of seven de-miners, dressed in blue blastproof vests and thick plexiglass visors, is methodically removing the top 5 inches of soil from an overgrown lot. Each team member focuses on a narrow, taped-off section of the field. They gently scrape away the soil with a small hoe. They pluck out any rocks and gingerly cut the roots of weeds and small bushes with clippers. Inch by inch, each team member moves forward through the dirt. The land that Handicap International is clearing sits in a fork in the Pan American Highway adjacent to a bus stop. "A field like this for me is very dangerous," Cifuentes says. "There are people who don't know this area who might walk through here. 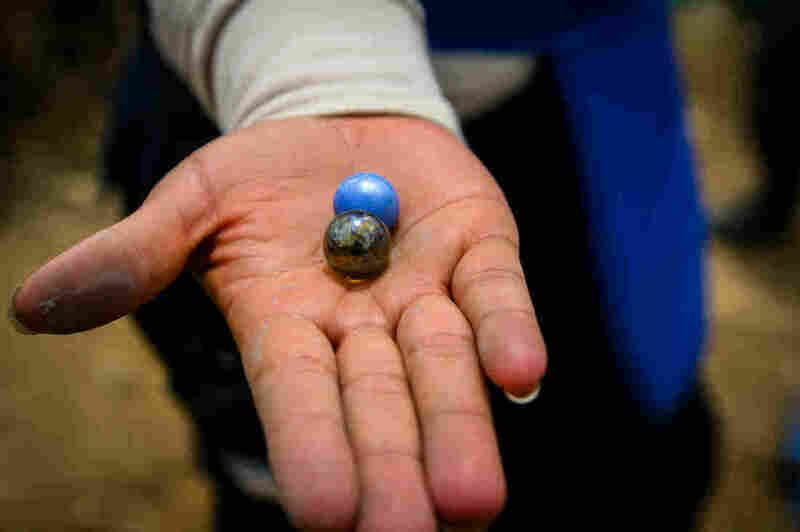 A child playing with a ball could get killed by a bomb like the one we found here yesterday." Just the day before, his team unearthed a crude, improvised explosive. It was a baby-food jar packed with gunpowder and ball bearings. 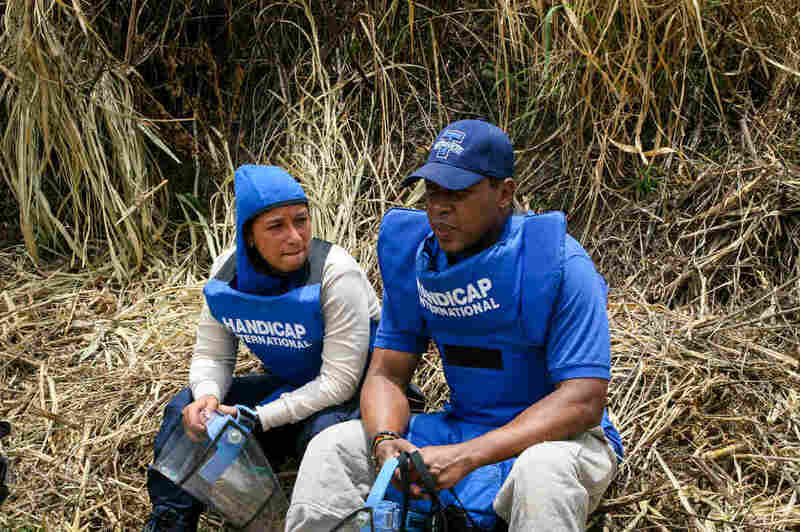 "The majority of anti-personnel mines here in Colombia are homemade. They use any type of container — a soda bottle, a wood box, a baby-food jar, plastic," he says. When a team comes to a place to de-mine, he says, "we don't know what we are going to come across." That makes searching for explosives even harder. Team members use hand-held metal detectors, but at times these are ineffective because some of the explosives don't have much metal in them. Johanna Galuis, a field supervisor at the site, says her role on the de-mining team is more than a job — it's a chance to do something for her country. "For me and for all Colombians, this is an opportunity," Galuis says. 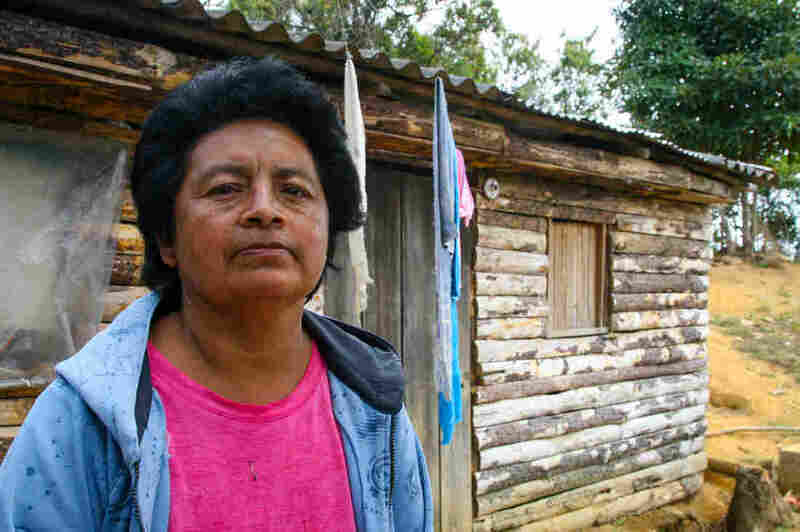 She says de-mining can help Colombians put the decade-long conflict behind them. "It's an opportunity that shouldn't be wasted." Galuis is wearing the same blastproof smock and thick plexiglass face shield as the de-miners she is monitoring. "They need to dig out 13 centimeters [5 inches] of soil," Galuis says of the de-miners hunched in the dirt in front of her. Mine clearing is an incredibly slow process..
"For example, it's taken nearly three months to clear this lot," she says, gesturing at the triangular plot of land that's roughly 25 yards long on each side. And she confesses that the work is scary. "The fear is always there," she says. "If you say you're not afraid, you're lying. But if you do things calmly, work carefully, everything will come out well." And she says the work is gratifying. "You enter a place where there was a lot of fear. People couldn't go into the fields; they couldn't grow crops. They couldn't walk in certain areas," she says. After de-mining, "there's the satisfaction that now they can do that." Maria Yolanda Mosqueda lives across the street from the lot where the Handicap International team is working. The place terrifies her, she says, and she wouldn't risk walking through there. Before the lot was fenced off, kids used to cut through on their way to school. Once this patch of land is finally declared mine-free, Mosqueda says, it will be as if a weight is lifted from the whole community.